UNIVERSITY OF MALTA AEGEE celebrates Ten Years 2007, is going to be a special year for a budding student organization, based at University of Malta. This year, AEGEE-Valletta, one of the leading student organizations, will be celebrating its 10th year anniversary, with a bang. Speaking at a press conference, held during the jam-packed annual AEGEE-Week, Mr. Johann Schembri, President of the local antenna, talked about the humble beginnings of AEGEE in Malta, the achievements that occurred throughout the past 10 years, and what is keeping AEGEE alive on campus, year after year. AEGEE-Week is being held between the 5th and the 9th of March 2007, which includes campus debate on EURO-Changeover, and a special European Village, which promotes the richness in diversity between European countries. Moreover, AEGEE-Week shall also be promoting the 20th anniversary of Erasmus Exchange Program, which AEGEE continues to actively support through its local antennas, scattered all over 260 academic cities in 40 European countries. University students are being encouraged to participate in the debates and be active in student organizations, to experience a different perspective of university life. Mr. Johann Schembri explained that AEGEE-Valletta was founded in 1997, without ever thinking what it could become in 10 years time. 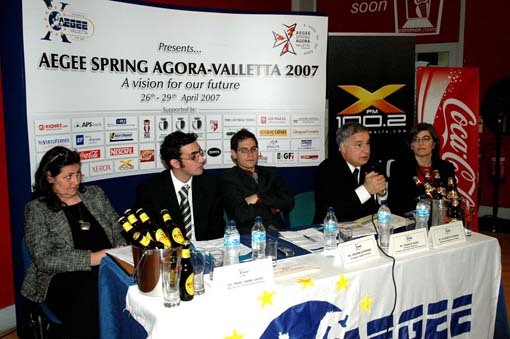 Several awards were given to the association, including, Youth in Maltese Society Award in 2000 on a local level, and on European level, AEGEE-Valletta took Second-Best Antenna Award in 2004 and Best Event out of all 260 Antennas across 40 countries in 2005. During last Freshers’ Week, AEGEE-Valletta was awarded with the Second Best Active Student Organisation on campus for the year 2006. “Having said this, we still experience a lot of students that have no clue what being active on campus means in their minds!”, said Mr. Johann Schembri. “Thanks to organizations like ours, quite a few, take onboard this challenge. Maybe it is time to emphasize and act more upon the recognition of informal education whereby students in student organizations are rewarded and encouraged to organize more events, debates and activities that will leave a mark on their student life before they move into the working environment”, concluded Mr. Schembri. A special committee, made up of past AEGEE committee members, and led by past-president, Mr. David Ciliberti, has been set-up to support the 10th year anniversary celebrations. AEGEE-Valletta has managed to bid successfully to host the bi-annual General Network Meeting, aka AGORA, in Malta. 600 fellow AEGEEans will be travelling to Malta, between the 26th and 29th of April, to participate in the intensive plenaries and workshops that will shape the future of AEGEE for the coming year. Mr. David Ciliberti, explained the importance of this AGORA project for the whole AEGEE network. During the AGORA, AEGEE members discuss current issues and topics that are relevant to European students and from where, ideas are turned into projects and launched in several conferences, seminars and activities that are held throughout the year, across the network. Moreover, the AGORA being held in Malta, is a perfect showcase for AEGEE-Valletta, being its’ 10th year anniversary; for Malta, because it includes fantastic PR effect on the whole network of over 17,000 students; and for University of Malta, because 600 students will have the opportunity to view our University facilities. “It is our pleasure, as an active student organization on campus, to have managed to work hand in hand with the University authorities, to be able to organize this mammoth project of hosting our fellow AEGEEans on campus, for 4 days”, commented Mr. David Ciliberti, AGORA Main Coordinator. The AGORA event is being supported by the University of Malta, together with the support of the Ministry of Education, Youth and Employment. Attending the press conference were also, Dr. Mary-Anne Lauri, Pro-Rector for Student Affairs, Mr. Frans Borg, Permanent Secretary at the Ministry of Education, Youth and Employment, and H.E. Dr. Elisabeth Kehrer, the Austrian Ambassador for Malta. The Embassy is a supporting partner of AEGEE-Valletta on this prestigious project. Mr. Frans Borg, Permanent Secretary at the Ministry of Education, Youth and Employment whilst congratulating AEGEE-Valletta for its 10th year anniversary, pledged his ministry commitment to help Youth Organisations like AEGEE-Valletta, not only to air their views but to share in decision-making policies. “This is in line with local and European policies with particular reference to the European Pact”, concluded Mr. Borg. The Pro-Rector at the University of Malta, Dr Mary-Anne Lauri, concluded by hoping that the AGORA project will bring European students together to discuss issues close to their heart, with an open-mind. During the AGORA, 2 particular workshops will be held, namely, Student Mobility Issues and Euro-Islam. At the end of the press conference, AEGEE-Valletta launched a special limited edition publication portraying its 10 years of activities. Special articles have been written by key ex-committee members, describing their particular years within the organization.